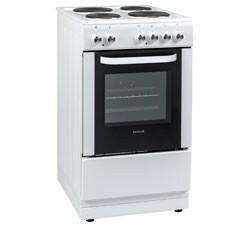 The Servis SSE50W freestanding White A rated electric cooker has a stylish slim design, as well as easy clean surfaces. Update your kitchen with this good-looking white 50cm cooker. Bringing you more cooking support but without all the usual post meal clear-up, it’s made with an enamelled interior that’s easy to clean.